Nagel, Librette 16, 120 roll film camera. Photograph gallery. Although our Librette was in terrible condition when received, the task of rebuilding it was undertaken as a challenge. 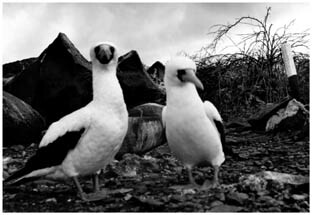 A deadline was set as the original donor was making a visit to the Galapagos Islands and it would be nice if the camera's rescuer could take it on such a wonderful trip. The restoration was completed with a couple of days to spare, and with no time to test it, the camera was loaded with film, a very quick training session given to the operator and off it went! I only had one specific instruction, to photograph a Galapagos Tortoise if possible. 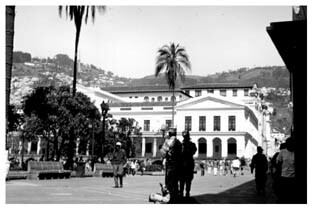 Above left we have the main Town Square in Quito whilst at top right are two Blue footed Boobies. 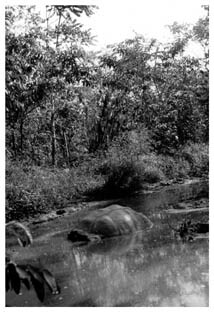 Mission accomplished, one Galapagos Tortoise, cooling off in a river.